You don't need a plot of land to grow fresh vegetables. Many vegetables lend themselves well to container gardening. With some thought to selecting bush or dwarf varieties, almost any vegetable can be adapted to growing in a pot. Even if you want your favorite full-size variety, if you give it a large enough pot and plenty of soil and water, it will grow just fine and reward you with plenty. 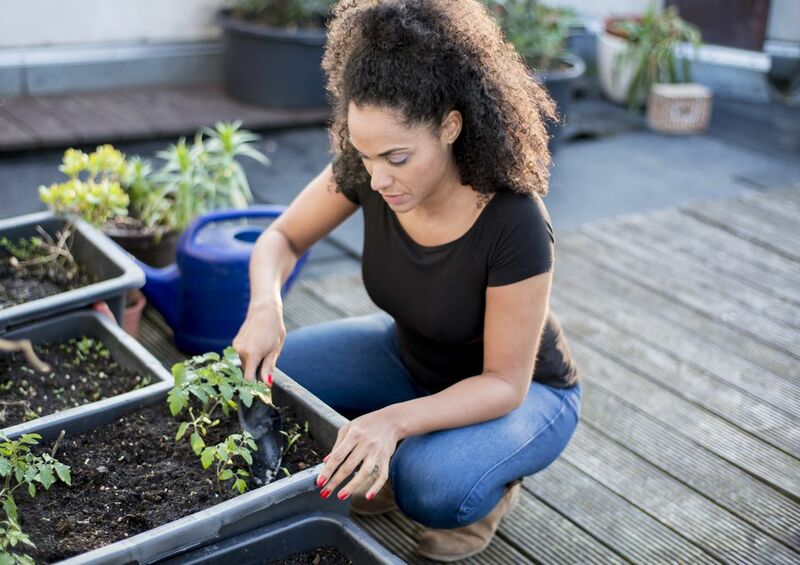 Vegetables that take up little space, such as carrots, radishes, and lettuce, or crops that bear fruits over a long period, such as tomatoes and peppers, are perfect for container vegetable gardens. What you can grow in a container vegetable garden is limited only by the size of the container and your imagination. How about a Summer Salad container? Plant a tomato, a cucumber, and some parsley or chives all in a large (24-30 inch) container. They grow well together and have the same water and sun requirements. By late summer they might not be very pretty, but they'll keep producing into the fall. This makes a great housewarming present, too. Since your vegetable plants will be making their containers home for the season, you want to start them off right. Make sure there is enough space for them to grow into and choose your soil and site with care. Selecting Containers: Containers for your vegetable gardens can be almost anything: flower pots, pails, buckets, wire baskets, bushel baskets, wooden boxes, nursery flats, window planters, washtubs, strawberry pots, plastic bags, large food cans, or any number of other things. Drainage: No matter what kind of container you choose for your vegetable garden, it should have holes at the base or in the bottom, to permit drainage of excess water. Vegetable plants will die if left sitting in wet soil. Color Considerations: You should be careful when using dark colored containers outdoors because they absorb heat which could damage the plant roots. If you do use dark colored pots, try painting them a lighter color or shading just the container, not the plants. Size: The size of the container is important. For larger vegetables like tomatoes and eggplants, you should use a five-gallon container for each plant. You can grow these plants in two-gallon containers. However, you need to give the plants considerably more water. There's more on container size under the tips for specific vegetables. You can use soil in your container vegetable garden, but potting mixes are much better. Peat-based mixes, containing peat and vermiculite, are excellent. They are relatively sterile and pH adjusted. They also allow the plants to get enough air and water. Mixing in one part compost to two parts planting mix will improve fertility. Using a slow release or complete organic fertilizer at planting will keep your vegetables fed for the whole growing season. Pots and containers always require more frequent watering than plants in the ground. As the season progresses and your plants mature, their root system will expand and require even more water. Don't wait until you see the plants wilting. Check your containers daily to judge the need for water. Wind can be a real hazard for any container-grown plant, and tall vegetables - like tomatoes or trellised cucumber and squash - become top heavy as they produce fruits. Try to place your containers so that they are not in an overly windy location. A breeze will provide nice air circulation and help prevent fungal diseases, but a strong wind can topple plants and containers and can also shred leaves and dislodge fruits. If you are gardening on a raised deck or a rooftop, it may be necessary to provide some type of wind block.